Typing on a Mac or PC with a real keyboard is second nature to most of us, but typing on the glass screens of our phones and tablets is still annoying. We get by, but no one actually likes the experience. We feel inefficient when typing on them, shortening our thoughts and being less clear because it’s so much harder. Bluetooth keyboards are cool, but most of them have the drawback of being connected to only one device at a time. Switching Bluetooth between devices is a nightmare none of us wants to endure. Imagine if you could sit at your Mac or PC and use a single keyboard with a dial to switch between your computer and your phone and your tablet. That would be pretty awesome. Logitech has a keyboard that might solve this problem for you. It’s the k480 Bluetooth Multi-Device keyboard. We’ll just call it the k480 for short. I picked up one of these from Amazon for $40, thanks to George from Tulsa posting in our Deals section on our Google Plus community. The first thing I noticed about the Logitech k480 is that it’s definitely not something you’ll throw in your kit bag when you dash out of the house because it’s HEAVY, weighing in at 1lb 12oz (that’s 800g to the rest of you). The k480 has a really nice rubberized slot above the keys where you can stand up your phone, your tablet, or both at the same time. This makes it really slick to use while working. On the left side of the keyboard theres a dial to select up to 3 devices. 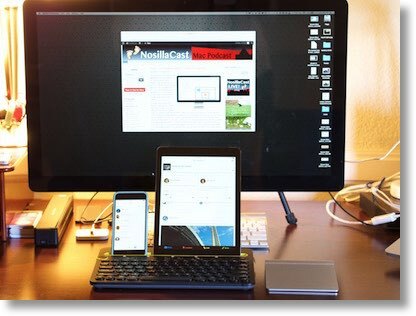 On the right side are two buttons for pairing your devices, one for Android, Windows or Chrome OS devices, and the other for Mac and iOS devices. Interesting that they require different buttons. Setup was REALLY simple. The k480 comes with two AAA batteries and with a simple slider switch on the bottom the keyboard was ready for setup. I put the dial on position 1, pushed the pairing button for Mac/iOS, paired it in Bluetooth settings on my Mac and it worked. Moved the dial to position 2, pushed the pairing button again, and opened Bluetooth on my iPhone and boom, connected. Repeated a 3rd time for my iPad and I’m in business on all three devices. I can now switch around between them seamlessly and type in any program on any device. There are some downsides to this keyboard. The keys feel ok and I got used to it fairly quickly but the keys are loud. Not slickly, just loud. There is no way to use this keyboard discretely. I really need to be able to look things up during recording sessions, plus this keyboard would be very annoying to anyone else in the room with me. The second problem is only an issue for Mac people – evidently the function and control buttons are swapped between Macs and PCs. That might not be a huge deal for Mac people if you don’t use those keys often, and I suppose if you made this your primary keyboard you could get used to it, but it pretty much drives me nuts. I use command-control-shift-4 to capture screenshots to the clipboard all the time, and they kept dumping out onto my desktop instead of going into the clipboard and I couldn’t figure out why. I finally realized the keys were switched so I was hitting function when I wanted control. Again, perhaps you can get used to it. With the Continuity functions of Yosemite and iOS 8.4, I don’t find I need to use my iOS device’s to respond to things nearly as often, and can use my Mac to write text messages for example, but if you’ve got a mixed device household or you’re a big fan of WhatsApp which for some inane reason doesn’t have a desktop or even web interface for the Mac, you might want to check out the Logitech k480 Bluetooth Multi-Device Keyboard. That is, if you don’t mind a loud keyboard! Richard – I totally forgot bout Type2Phone. I reviewed it years ago!